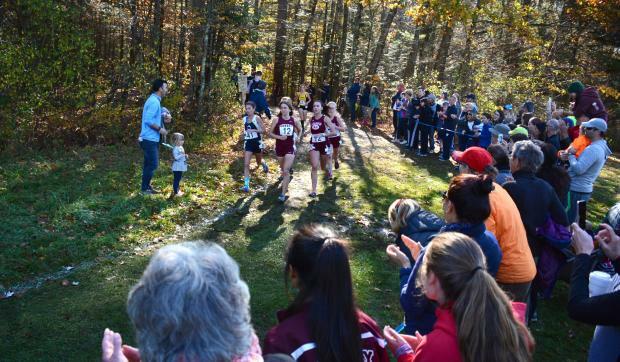 The Girls Class C race kicked off the day at Twin Brook and did not disappoint. The lead pack provided the assembling crowd with a race for individual supremacy that didn't see a clear leader break loose until the lead pack emerged from the pain cave. Olivia Reynolds from Maine Coast Waldorf just managed to put some space between herself and the rest of the pack when she was back out on the grass. Reynolds floated down the finish line chute in 20:13, giving her a nine second margin over her closest followers. Even still lead changes in the following four gave the Red Riot of Orono the one point margin that they needed to take the State Championship from the Maranacook Black Bears. 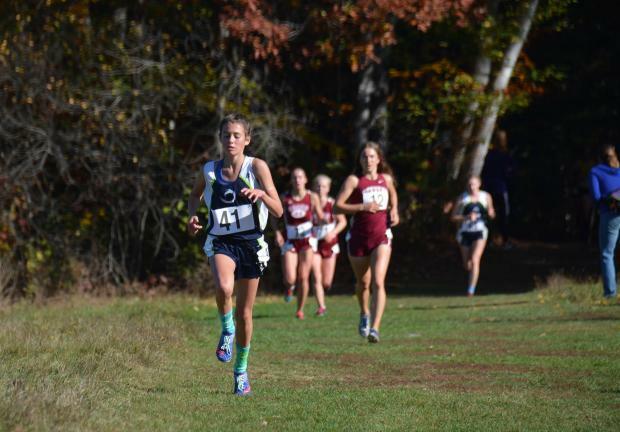 After a dead sprint in the final hundred meters Camille Kohtala moved from what looked like a 3rd or 4th place finish when the leaders first took to the grass for the final 400 meter push to second place. 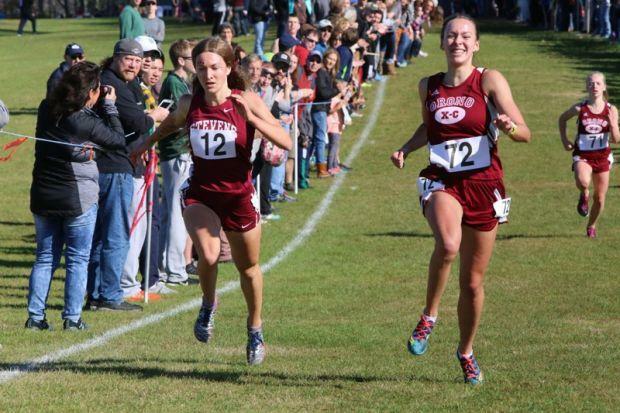 Kohtala took the second spot by just 0.16 seconds; her run to the second spot came at the expense of Eliza Broughton of George Stevens Academy. The pair have split four 5Ks this season and Broughton took two shorter races so they have seen plenty of each other this season. 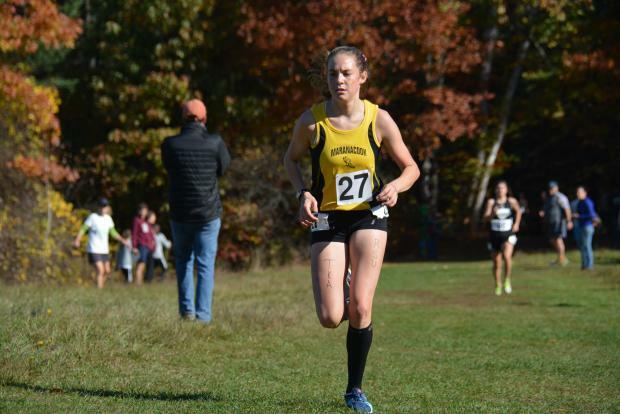 Most remarkable about Kohtala's run was the fact that, at 20:22.76, it was just two seconds off the time she had put up at the "fast" course last week at the Northern Regional in Belfast when she finished 3rd at 20:20.52. For most of the race lead pack made a flying wedge of five with Broughton holding down the center and lead spot but flanked closely by a pair of Olivia's. Maine Coast Waldorf's Olivia Skillings off one shoulder while Olivia Reynolds occupied the the other shoulder. Kohtala, and fellow Red Riot Erin Gerbi completed the wedge. Just off this pack was Maranacook's lead runner Molly McGrail. This pattern persisted past the two mile marker with just minor shifting. As the lead pack emerged from the inner loop into the biggest throng of spectators outside the finish area they ran as one, in perfect unison. It took the second pass through the Hill Loop to provide some separation. Including the narrow, steep climb of pain cave, the loop is just about six-tenths of a mile and provided Reynolds what she needed to grab the title. But it still took the flat of the run out to determine the team title. As important as Kohtala's sprint to the finish was cross country is still a team sport. A swarm of yellow uniformed Black Bears from Maranacook filled the chute so that only score keepers and those very quick with the arithmetic of placing and displacement were confident in the results until the official results were posted. 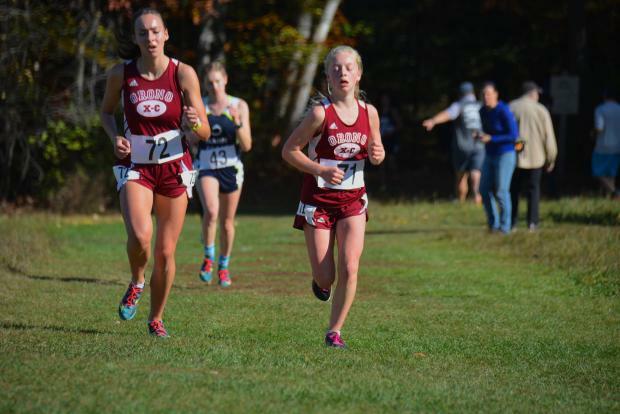 Following Kohtala and scoring for Orono were Erin Gerbi (4th), Liza Gallant (14th), Julia White (25th), and Kaili Gaetjen (27th). 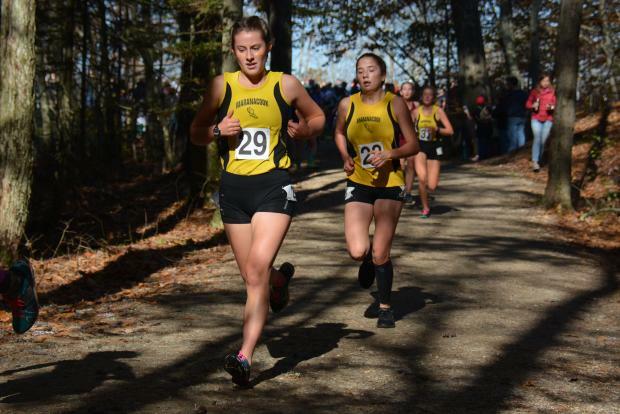 Gaetjen was awarded 26 points as the 26th finisher Jordyn Ritchie from Katahdin High School had qualified as an individual; Katahdin was not eligible for the team title. Orono finished with 71 points. 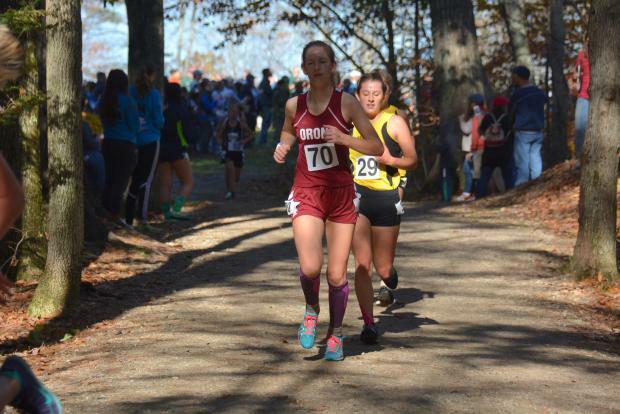 Runner-up Maranacook was led by sophomore Molly McGrail with a 6th place finish. Following McGrail in scoring for the Black Bears were Sophie O'Clair (11th), Laura Parent (12th), Maddie Taylor (19th) and Dana Reynolds (24th) giving the Black Bears 72 points. Though Orono held a one point margin, the Black Bears brought in a slightly lower total time--1:47.01 for Maranacook to 1:47.04 for Orono. Broughton's GSA team took the third spot with 79 points. 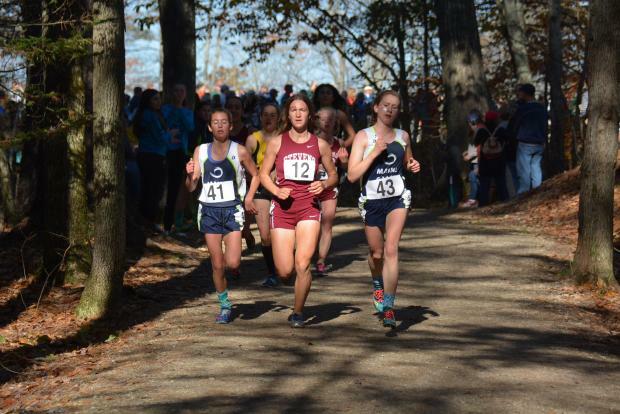 Rounding out the top ten finishers were senior Olivia Skillings (5th) of Maine Coast Waldorf, Alexandra Hammerton (7th) of St. Dom's, senior Grace Graham (8th) of Greater Houtlon Christian Academy, and two seniors from GSA Zeya Lorio (9th) and Mary Richardson (10th).